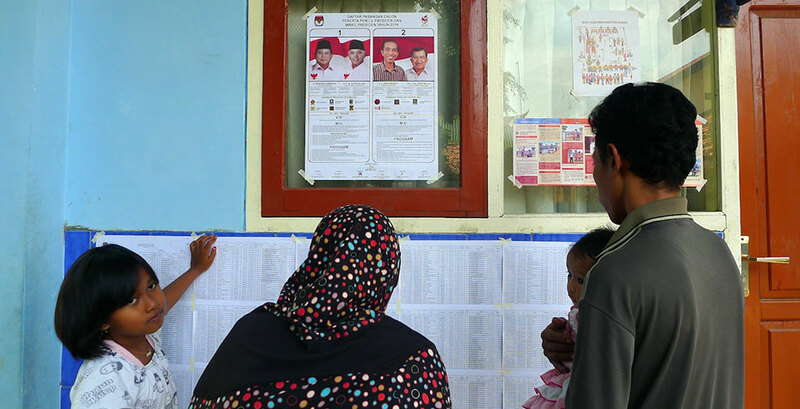 On July 9, 2014, Indonesia held its third presidential election. Wellesley’s Christopher Candland, associate professor of political science, researches the political dimensions of human development, based on comparative and quantitative studies within Southern Asia, and he points out the significance and magnitude of this election. Indonesian voters made history yesterday when they participated in the world’s largest election for a single office. India is the world’s most populous democracy. But Indian voters do not elect their prime minister or president; Indian legislators do. The United States, where the names of presidential candidates do appear on the ballot, is the world’s second most populous democracy. In 2012, 129.067 million Americans cast votes in the presidential race. In Indonesia yesterday, more than 150 million Indonesians turned out to vote in an election that pitted the mild-mannered governor of Jakarta, Joko Widodo, against a forceful former Special Forces commander, Prabowo Subianto. The candidates could hardly be more different in temperament or background. Jokowi is the son of an itinerant carpenter who built his small home with his own hands. He has a degree in forestry, was a furniture maker, and served as the mayor of one of Java’s most culturally refined towns, Surakarta. His party, the Indonesian Democratic Party of Struggle, persuaded him to contest the election that made him the Governor of Jakarta, the largest metropolis in Southeast Asia. In the presidential debates, Jokowi demonstrated his impeccable manners by not criticizing his opponent but rather emphasizing his own accomplishments and plans. Prabowo is the grandson of the founder of Indonesia’s first national bank, a graduate of the prestigious Indonesian National Military Academy, and a former commando trained at Fort Benning and Fort Bragg. He was dismissed from the military in 1998 for kidnapping students who were protesting against the 32-year dictatorship of General Suharto, Prabowo’s then father-in-law. Another former commando claims to know where the students’ bodies are buried. Prabowo has persuaded his supporters that only he is firm enough for presidential office in the world’s third most populous democracy. The photos here are from the polling place (an elementary school) in Karangsari, Tuban, East Java. They include a family examining the official poster with information about the candidates posted outside of the polling place and the list of registered voters below it; the inside of the polling place; a woman inking her finger after voting, and a woman showing that she has voted. People tended to come with their families; older people were more likely to dress up for their visit to the polling place. Folks took their time, knowing that they would bump into neighbors or former schoolmates that they might not have seen for a while. All of the conversations I heard were pleasant social exchanges about the activities and health of relatives. As in my hometown in rural Pennsylvania, where my mother is an election official, people don't consider it polite to talk about politics at the polls. Voting rules seemed to be followed closely; one woman, although known to the election officials, was politely asked to return home to collect her registration letter before being allowed to vote. Exit polls and ballot sampling suggest that Jokowi, as Joko Widodo is popularly known, will win, but by a very narrow margin. Prabowo, citing a previously unknown polling agency, claims that he has the people’s mandate. The current president, Susilo Bambang Yudhoyono, has appealed for calm. He has invited the candidates to his residence for a meeting this evening. The General Election Commission of Indonesia will announce results on July 21. The new president, to be sworn in on October 20, 2014, will be the winner of the largest election for a single seat in history.